KJIPUKTUK (Halifax) - On Tuesday, August 4 of this year, communities bordering St George’s Bay in northern Nova Scotia were confronted by something both frightening and extraordinary - the sight of 16 enormous, sleek, black pilot whales stranded on shore, slowly dying in the harsh coastal air. A mass stranding, as it’s called, occurs when an entire pod or school of marine animals becomes trapped on shore, separated from their watery abode by the retreating tide. 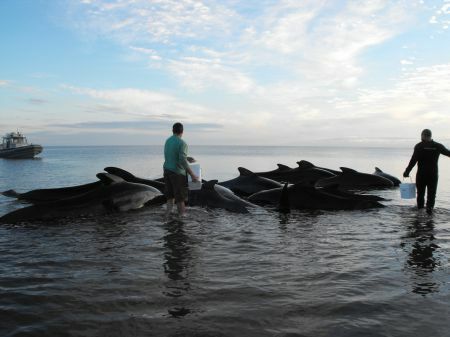 Pilot whales are a common victim because of their social nature - if one becomes stranded its comrades refuse to leave it behind, thus becoming stranded themselves. It’s a foolhardy selflessness us humans can certainly empathize with. Perhaps it’s this same empathy which saved most of the 16 whales who washed ashore that day, near the community of Judique, and the 14 others who washed up the day afterward near Bayfield, also on St George’s Bay. Instead of succumbing to fate and drying to death on their perspective beaches, these whales were spared - carried to safety by people willing to submerge themselves up to the neck if it meant saving a life. Among the many heroes who made themselves known on the shores of St George’s Bay that week, a particular group of professionals took charge above all. They coordinated the dozens of volunteers, taught them the techniques necessary to move four tonne, seven metre long whales across rock and sand safely, brought the equipment and made sure more good was done than unintentional harm. This group is called MARS. The Marine Animal Response Society saw its beginnings in 1999 when a young Tonya Wimmer, then a graduate student with Whitehead Lab at Dalhousie University, recognized the need for a network of marine first-responders, so to speak. News of stranded (live) or beached (dead) marine animals came to her constantly and there was very little she could do. “I thought it was a shame there was no one keeping track of these incidents or trying to help [in the case of a living animal],” said Wimmer. Not only were some of these marine deaths entirely avoidable, Wimmer lamented each incident as a lost opportunity to study these animals, living or dead. She breathed life back into a discontinued initiative called the Nova Scotia Stranding Network - which later became MARS - and created a hotline for Nova Scotians to report marine animals in distress. Then she pulled together partners and volunteers to help in her work, and in time built relationships with likeminded people in New Brunswick and PEI. 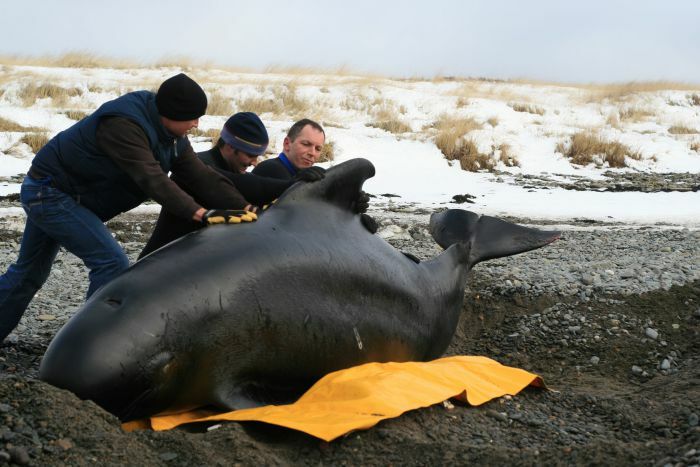 A series of incidents involving beached and stranded sperm whales across all three province’s prompted these likeminded groups to unite under one banner in 2007, giving birth to the Maritime Marine Animal Response Network. This network, which included ten groups across the three provinces, was and is coordinated by MARS. MARS itself is run by Wimmer and her colleague Andrew Reid, with the support of over 100 volunteers. All together, they receive 200-400 calls each year. But regardless of the lives they’ve saved or the suffering they’ve spared, MARS’ greatest contributions to the Atlantic coast have been scientific rather than humanitarian. As a trained scientist, Wimmer sees every case as an opportunity to learn, every animal in distress and carcass washed ashore as a wealth of information in need of documentation. The work of her and her colleagues has narrowed some longstanding gaps in our understanding of marine ecosystems in Atlantic Canada. They’ve broached the topics of biology, distribution, morphology, diet, ecology, genetics and causes of premature death. How many of these deaths are natural, how many are human caused, and how can the latter category be prevented? MARS’ research has informed marine conservation strategies across Atlantic Canada and has also helped measure the success of those strategies. When shipping lanes in the Bay of Fundy were changed to avoid right whale critical habitat in 2003, MARS took part in cataloging new scars and deaths among right whales to see how many were still caused by ship collisions. For those who are interested, the incidents of collision seem to have dropped considerably. Tonya Wimmer has dedicated 16 years to MARS and in her time she’s responded, personally, to between 300-500 calls. She’s seen everything from sperm, right, fin and humpback whales to smaller species like pilot whales, dolphins, porpoises and seals, alive and dead, on shore and out to sea. She can attest to the importance of proper training when dealing with such immense animals, some of whom may be very stressed and therefore dangerous. This is why MARS’ work extends beyond animal rescue, even beyond research, into the indispensable realm of education. Sometimes it’s as simple as visiting classrooms or naturalist organizations and helping them understand the basics of animal identification and rescue. Sometimes they expose students in marine biology or even fisheries officers to their thorough training program. The goal is to have each of their educational clients leave with the ability to respond capably to an emergency, whether that means knowing who to call and how to manage a scene until help arrives, or rolling up one’s sleeves and taking part. MARS is a registered Canadian charity and its workforce is driven by passion rather than pay-cheques. The funds which sustain their research, rescue efforts and education come from a network of people both stirred by the cause and in a position to crack open their wallets. They of course receive grants from private organizations and the federal government to keep themselves afloat, but the reach of their efforts and the diversity of situations they can respond to depend on the Atlantic Canadians willing to donate their time, their money or their resources. If you happen to be one of these people and are interested in throwing your support behind the Marine Animal Response Society, you can do so on their website at marineanimals.ca. But the simplest contribution anyone can make to MARS is to call their hotline in the case of a distressed or dead marine animal, washed ashore or on the open ocean and in need of their attention - 1-866-567-6277. Zack Metcalfe is a freelance environmental journalist, author, and writer of the Endangered Perspective. He operates out of Halifax, Nova Scotia.